Journal of the House of Lords Volume 31, 1765-1767. Originally published by His Majesty's Stationery Office, London, 1767-1830. Address to His Majesty on his Behalf. Message from H. C. to return the Regency Bill. Wrought Silks and Velvets, additional Duties on. Bill. Duties on Gum Senegal, and Gum Arabic, Bill. Militia Pay and Cloathing. Bill. Illicit Trade to Isle of Man to prevent, Bill. Message from thence, to return the Bill for the E. of Carlisles Guardians to sell Estates. To enable His Majesty to Prohibit the Exportation of Corn, Bill. Duties on Corn, to discontinue for a limited Time, Bill. Duties on Gum Senegal, &c. Bill. Message to H. C. that the Lords have agreed to the Six preceding Bills. For vesting Forts in Senegal in His Majesty, Bill. Militia Laws to amend, Bill. Riot in Palace Yard; Order for the High Bailiff of Westminster, and High Constable, to attend. To redeem One Fourth Part of certain Annuities, Bill. and De Missys and Le Royers Nat. Bill. His Majesty to prohibit the Exportation of Corn, Bill. Duties on Corn, to discontinue for a Time, Bill. High Bailiff and Justices directed to disperse the Mob in Palace Yard. To improve the Revenue of the Customs, Bill. To enable His Majesty to prohibit Exportation of Corn, Bill. Duties on Corn to discontinue for a Time, Bill. Message to H. C. that the Lords agreed to the Two preceding Bills. To return One fourth of certain Annuities, Bill. Revenue of Customs to improve, Bill. To vest the Forts in Senegal in His Majesty, Bill. Complaint of a Mob at the Door of this House. Ordered to be printed, and Copies sent to the Ld. Mayor, Sheriffs, and High Bailiff. Address to His Majesty, for a Proclamation to suppress Rios. Complaint of a printed News-paper, and Woodfall ordered to attend. The Kings Answer to Address relating to Mr. Wight. Mr. Cowpers Appointment of Mr. Strutt to be Clerk Assistant, during Mr. W. Cowpers Sons Minorities, and till One of them is approved of by the House. Epus. Londin. Comes Northington, Cancellarius. Ds. Abergavenny. Epus. Bath. & Wells. Dux Bedford, Praeses. Ds. Leigh. Epus. Asaphen. Ds. Berkeley Str. Epus. Litch. & Cov. Dux Richmond. Ds. Delamer. Epus. Bangor. Dux Ancaster, Mag. Ds. Cathcart. Epus. Norvicen. Dux Newcastle. Ds. Masham. Epus. Meneven. Dux Portland. Ds. Bathurst. Epus. Landav. Dux Chandos. Ds. Ducie. Epus. Lincoln. March. Rockingham. Ds. Chedworth. Epus. Carlioll. Comes Talbot, Senescallus. Ds. Edgecumbe. Comes Gower, Camerarius. Ds. Bruce. Comes Scarbrough. Ds. Lovel & Holland. Hodie 3a vice lecta est Billa, intituled, An Act for repairing and widening the Road from the Turnpike Road in Banbury in the County of Oxford, through Daventry and Cottesbach, to the South End of Mill Field in the Parish of Lutterworth in the County of Leicester. The Question was put, Whether this Bill shall pass? Hodie 3a vice lecta est Billa, intituled, An Act for dividing and enclosing several Lands and Grounds, Undivided Enclosures, Commons, and Wastes, in or near the Village or Hamlet of Marsborough, in the Township of Kimberworth, and in the Parish of Rotherham, in the County of York. Hodie 3a vice lecta est Billa, intituled, An Act for dividing and enclosing the Open and Common Fields and Common Pastures of Sealford, in the County of Leicester, and all the Lands and Grounds within the same Fields. Hodie 3a vice lecta est Billa, intituled, An Act to continue the Term and render more effectual an Act, passed in the Thirtieth Year of the Reign of His late Majesty, for repairing and widening the Roads leading from Spalding High Bridge, through Littleworth, and-by Frognall, and over James Deeping Stone Bridge in the County of Lincoln, to Maxey Outgang in the County of Northampton, adjoining to the High Road there. Hodie 3a vice lecta est Billa, intituled, An Act for dividing and enclosing the Open and Common Fields, Common Meadows, Common Pastures, and other Commonable Lands and Grounds, in the Parish of Felmersham, in the County of Bedford. The Question was put, Whether this Bill shall pass ? Hodie 3a vice lecta est Billa, intituled, An Act for amending and widening the Road from the North End of Old Malton Gate, in the Town and Borough of New Malton, to the Town of Pickering, in the County of York. To acquaint them, that they have agreed to the said Bills, without any Amendment. The Lord Chancellor acquainted the House, That he is desired by Mr. Wight, the Clerk Assistant, to inform their Lordships, that he is in so bad a State of Health, as to be incapable of performing the Duty of his Office; and is therefore desirous, with Leave of the House, to resign his said Office of Clerk Assistant; but thinks it his Duty to acquaint their Lordships therewith, previous to such Resignation. Ordered, That an humble Address be presented to His Majesty; humbly to recommend the said Mr. Wight to His Majestys Royal Grace and Bounty, for his great Pains and Diligence for Forty Years and upwards, during his executing the several Offices of Reading Clerk and Clerk Assistant in this House. 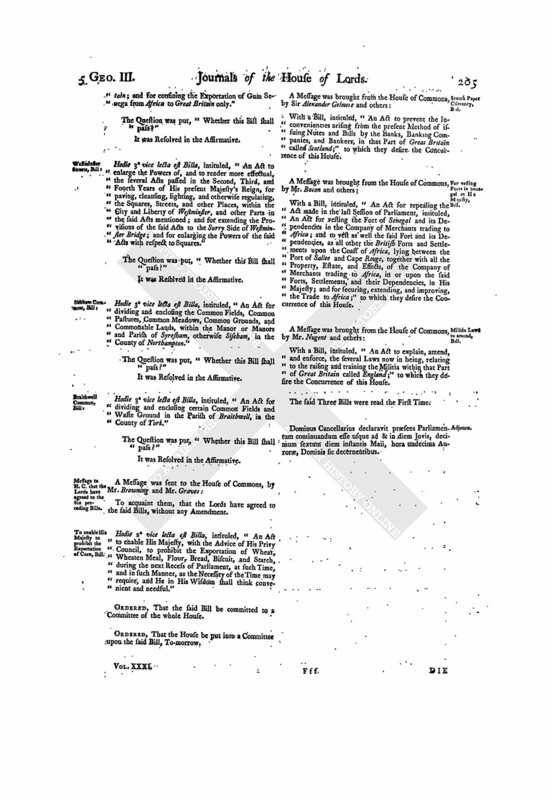 To return the Bill, intituled, An Act to provide for the Administration of the Government, in case the Crown should descend to any of the Children of His Majesty being under the Age of Eighteen Years; and for the Care and Guardianship of their Persons; and to acquaint this House, that they have agreed to the same, with some Amendments, to which they desire their Lordships Concurrence. The said Amendments, being read Thrice by the Clerk, were agreed to by the House. The Question was put thereupon. Hodie 2a vice lecta est Billa, intituled, An Act to continue Part of an Act made in the Thirtieth Year of the Reign of His late Majesty King George the Second, intituled, An Act to render more effectual the several Laws now in being, for the Amendment and Preservation of the publick Highways and Turnpike Roads of this Kingdom; and for making further Provisions for the Preservation of the said Roads. With a Bill, intituled, An Act for Relief of Insolvent Debtors; to which they desire the Concurrence of this House. The Earl of Sandwich acquainted the House, That His Majesty, having been informed of the Contents of the Bill, intituled, An Act for dividing and enclosing certain Common Fields and Waste Ground, in the Parish of Braithwell, in the County of York, was pleased to consent (as far as His Majestys Interest is concerned) that their Lordships may proceed therein as they shall think fit. Hodie 2a vice lecta est Billa, intituled, An Act to enlarge the Powers of, and to render more effectual, the several Acts passed in the Second, Third, Acts to the Surry Side of Westminster Bridge; and for enlarging the Powers of and Fourth Years of His present Majestys Reign, for paving, cleansing, lighting, and otherwise regulating, the Squares, Streets, and other Places, within the City and Liberty of Westminster, and other Parts in the said Acts mentioned; and for extending the Provisions of the said Acts to the Surry Said of Westminster Bridge and for enlarging the Powers of the said Acts with respect to Squares. Hodie 2a vice lecta est Billa, intituled; An Act for laying certain Duties upon Gum Senegal and Gum Arabic, imported, into, or exported from; Great Britain; and for confining the Exportation of Gum Senegal from Africa to Great Britain only. The House (according to Order) was adjourned during Pleasure, and put into a Committee upon the Bill, intituled, An Act for applying the Money granted in this Session of Parliament, for defraying the Charge of the Pay and Cloathing of the Militia of that Part of Great Britain called England for One Year, beginning the Twenty-fifth Day of March One Thousand Seven Hundred and Sixty-five; and for punishing Militia Men for neglecting their Duty. And the Lord Delamer reported from the Committee, That they had gone through the Bill, and directed him to report the same to the House, without any Amendment. The House also (according to Order) was adjourned during Pleasure, and put into a Committee on the Bill, intituled, An Act for more effectually preventing the Mischiefs arising to the Revenue and Commerce of Great Britain and Ireland, from the illicit, and clandestine Trade to and from the Isle of Man. And the Lord Delamer reported from the Commit tee, That they had gone through the Bill, and directed him to report the same to the House, without any Amendment. Hodie 1a vice lecta est Billa, intituled, An Act for the Relief of Insolvent Debtors. Dominus Cancellarius declaravit praesens Parliamentum continuandum esse usque ad & in diem Martis, decimum quartum diem instantis Maii, hora undecima Aurore, Dominis sic decernentibus. Epus. Winton. Comes Northington, Cancellarius. Ds. Botetourt. Epus. Litch. & Cov. Ds. Clifton. Epus. Bangor. Dux Bedford, Prses. Ds. Leigh. Epus. Lincoln. Dux Richmond. Ds. Cathcart. Comes Gower, Camerarius. Ds. Ducie. Hodie 3a vice lecta est Billa, intituled, An Act for applying the Money granted in this Session of Parliament, for defraying the Charge of the Pay and Cloathing of the Militia of that Part of Great Britain called England for One Year, beginning the Twenty-fifth Day of March One Thousand Seven Hundred and Sixty-five; and for punishing Militia Men for neglecting their Duty. Hodie 3a vice lecta est Billa, intituled, An Act for more effectually preventing the Mischiefs arising to the Revenue and Commerce of Great Britain and: Ireland; from the illicit and clandestine Trade to and from the Isle of Man. To return the Bill, intituled, An Act for vesting divers Manors, Lands, and Hereditaments, in the Counties of York, Cumberland, Northumberland, and Durham, late the Estate of Henry Earl of Carlisle, deceased, in Trustees, to be Sold and disposed of in and for the Payment of his Debts, Legacies, and Encumbrances, and other the Purposes in his Will mentioned; and to acquaint this House that they have agreed to the same, with One Amendment, to which they desire their Lordships Concurrence. The House proceeded to take the said Amendment into Consideration. And the same, being read Three Times by the Clerk, was agreed to by the House. A Message was sent to the House of Commons, by the former Messengers, to acquaint them therewith. With a Bill, intituled, An Act to enable His Majesty, with the Advice of His Privy Council, to prohibit the Exportation of Wheat, Wheaten Meal, Flour, Bread, Biscuit, and Starch, during the next Recess of Parliament, at such Time, and in such Manner, as the Necessity of the Time may require, and He in His Wisdom shall think convenient and needful; to which they desire the Concurrence of this House. 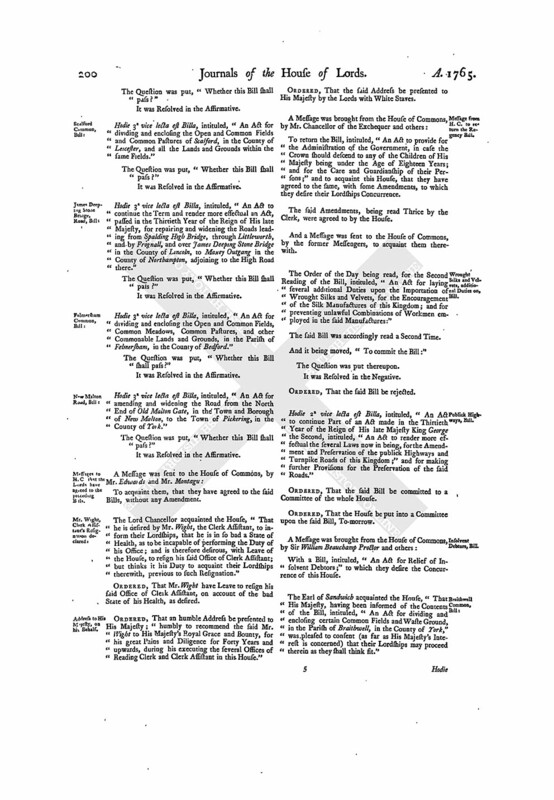 The Lord Delamer reported from the Lords Committees to whom the Bill, intituled, An Act for dividing and enclosing certain Common Fields and Waste Ground, in the Parish of Braithwell, in the County of York, was committed: That they had considered the said Bill, and examined the Allegations thereof, which were found to be true; that the Parties concerned had given their Consents, to the Satisfaction of the Committee, and that the Committee had gone through the Bill, and directed him to report the same to the House, without any Amendment. The Lord Sandys made the like Report from the Lords Committees to whom the Bill, intituled, An Act for dividing and enclosing the Common Fields, Common Pastures, Common Meadows, Common Grounds, and Commonable Lands, within the Manor or Manors and Parish of Syresham, otherwise Siseham, in the County of Northampton, was committed. 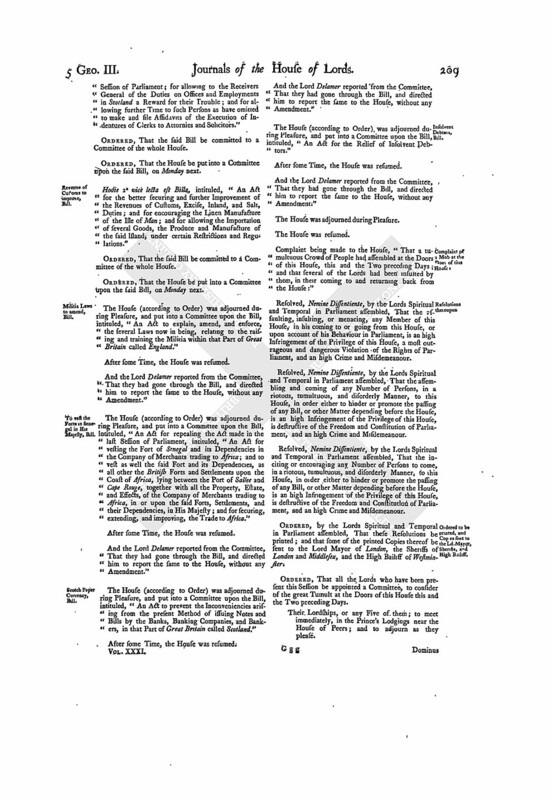 The House (according to Order) was adjourned during Pleasure, and put into a Committee on the Bill, intituled, An Act to continue Part of an Act made in the Thirtieth Year of the Reign of His late Majesty King George the Second, intituled, An Act to render more effectual the several Laws now in being, for the Amendment and Preservation of the Publick Highways and Turnpike Roads of this Kingdom; and for making further Provisions for the Preservation of the said Roads. And the Lord Delamer reported from the Committee, That they had gone through the Bill, and directed him to report the same to the House, with out any Amendment. 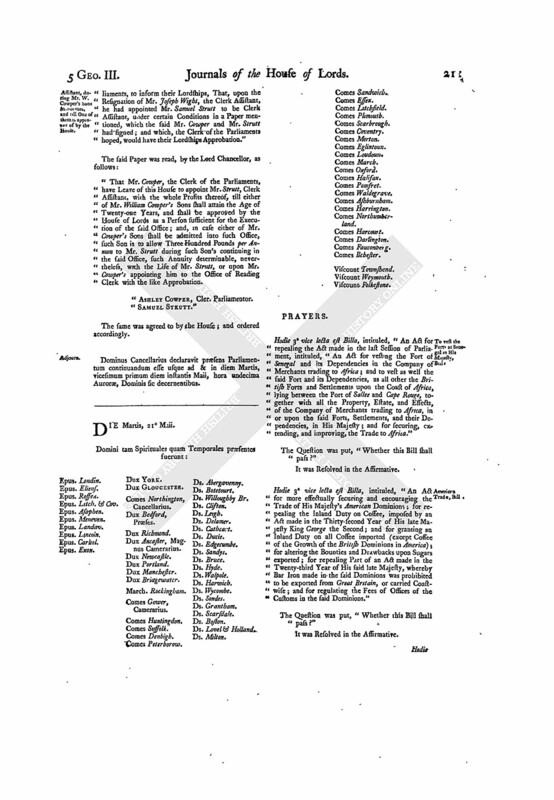 The House also (according to Order) was adjourned during Pleasure, and put into a Committee on the Bill, intituled, An Act for prohibiting the Importation of Foreign-manufactured Silk Stockings, Silk Mitts, and Silk Gloves, into Great Britain and the British Dominions; and for rendering more effectual an Act passed in the Third Year of the Reign of His present Majesty, for explaining, amending, and rendering more effectual, an Act made in the Nineteenth Year of the Reign of King Henry the Seventh, intituled, Silk Works. And the Lord Delamer reported from the Committee That they had gone through the Bill, and directed him to report the same to the House, without any Amendment. 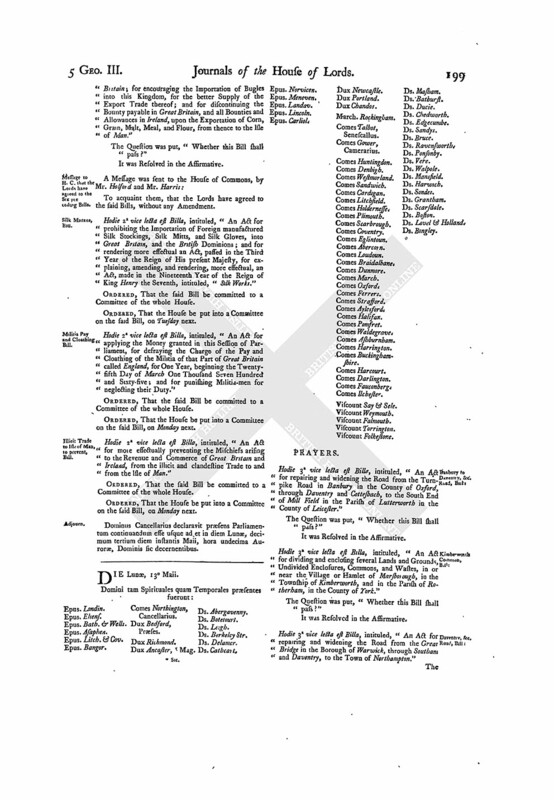 The House also (according to Order) was adjourned during Pleasure, and put into a Committee on the Bill, intituled, An Act to enlarge the Powers of, and to render more effectual, the Several Acts passed in the Second, Third, and Fourth Years of His present Majestys Reign, for paving, cleansing, lighting, and otherwise regulating, the Squares, Streets, and other Places, within the City and Liberty of Westminster, and other Parts in the said Acts mentioned; and for extending the Provisions of the said Acts to the Surrey Side of Westminster Bridge; and for enlarging the Powers of the said Acts with respect to Squares. The House also (according to Order) was adjourned during Pleasure, and put into a Committee on the Bill, intituled, An Act for laying certain Duties upon Gum Senegal and Gum Arabic imported into, or exported from, Great Britain and for confining the Exportation of Gum Senegal from Africa to Great Britain only. Dominus Cancellarius declaravit Prsens Parliamentum continuandum esse usque ad & in diem Mercurii, decimum quintum diem instantis Maii, hora undecima Auror, Dominis sic decernentibus. Epus. Eliens. Dux Gloucester. Ds. Le Despencer. Epus. Litch. & Cov. Ds. Botetourt. Epus. Landav. Comes Northington, Cancellarius. Ds. Clifton. Epus. Carliol. Dux Ancaster, Magnus Camerarius. Ds. Berkeley Str. Comes Talbot, Senescallus. Ds. Trevor. Comes Loudoun. Ds. Lovel & Holland. His Majesty, being seated on the Throne, adorned with His Crown and Regal Ornaments, and attended by His Officers of State (the Lords being in their Robes); commanded the Gentleman Usher of the Black Rod to let the Commons know, It is His Majestys Pleasure, they attend Him immediately, in this House. 1. An Act for granting Annuities, to be attended with a Lottery, to satisfy and discharge certain Navy, Victualing and Transport Bills; and for charging the Payment of such Annuities on the Sinking Fund. 2. An Act to alter certain Rates of Postage, and to amend, explain, and enlarge, several Provisions in an Act made in the Ninth Year of the Reign of Queen Anne, and in other Acts relating to the Revenue of the Post-office. 3. An Act for granting to His Majesty certain Duties on the Exportation of Coals, and of several East India Goods, and upon Policies of Assurance; for retaining, upon the Exportation of White Callicoes and Mustins, a further Part of the Duties paid on the Importation thereof; and for obviating a Doubt with respect to Stamp Duties imposed upon Deeds by Two former Acts. 4. An Act for more effectually supplying the Export Trade of this Kingdom to Africa with such coarse printed Callicoes, and other Goods, of the Product or Manufacture of The East Indies, or other Places beyond the Cape of Good Hope, as are prohibited to be worn and used in Great Britain; for encouraging the Importation of Bugles into this Kingdom, for the better Supply of the Export Trade thereof; and for discontinuing the Bounty payable in Great Britain, and all Bounties and Allowances in Ireland, upon the Exportation of Corn, Grain, Malt, Meal, and Flour, from thence to the lsle of Man. 5. An Act for repealing the Duties now payable upon Raw Silk imported, and for granting other Duties in Lieu thereof; for allowing a Drawback on the Exportation of Raw or Thrown Silk to Ireland; and for prohibiting the Exportation of Raw Silk from Ireland. Le Roy remercie ses bons Sujets, accepte leur Benevolence, & ainsi le veult. 6. An Act to provide for the Administration of the Government, in case the Crown should descend to any of the Children of His Majesty being under the Age of Eighteen Years, and for the Care and Guardianship of their Persons. 7. 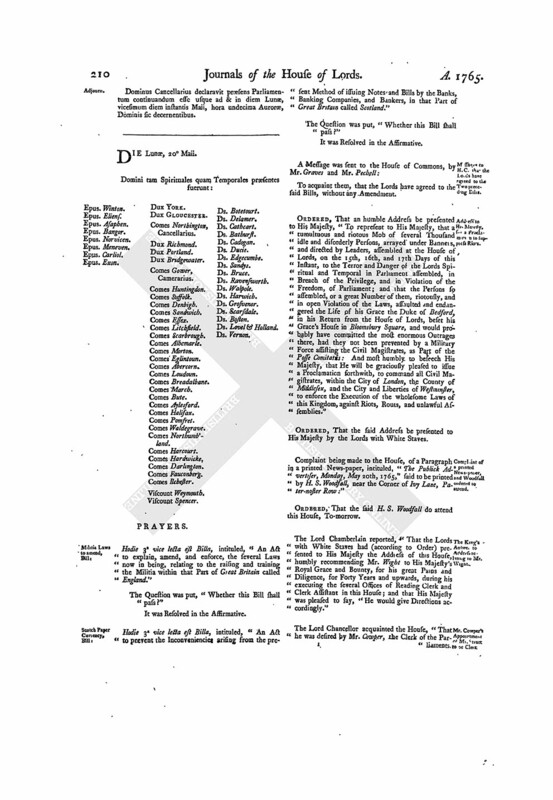 An Act for applying the Money granted in this Session of Parliament, for defraying the Charge of the Pay and Cloathing of the Militia in that Part of Great Britain called England for One Year, beginning the Twenty-fifth Day of March One Thousand Seven Hundred and Sixty-five; and for punishing Militia Men for neglecting their Duty. 8. An Act to amend and render more effectual, in His Majestys Dominions in America, an Act passed in this present Session of Parliament intituled, An Act for punishing Mutiny and Desertion, and for the better Payment of the Army and their Quarters. 9. An Act for more effectually preventing the Mischiefs arising to the Revenue and Commerce or Great Britain and Ireland, from the illicit and clandestine Trade to and from the lsle of Man. 10. An Act to empower the High Court of Chancery to lay out, upon Government Securities, a Sum of Money therein mentioned, out of the Common and General Cash in the Bank of England belonging to the Suitors of the said Court; and to apply the Interest arising therefrom towards augmenting, the Income of the Masters of the said Court. 11. An Act for repairing and widening the Road from the Turnpike Road in Banbury, in the County of Oxford, through Daventry and Cottesbach, to the South End of Mill Field, in the Parish of Latterworth, in the County of Leicester. 12. 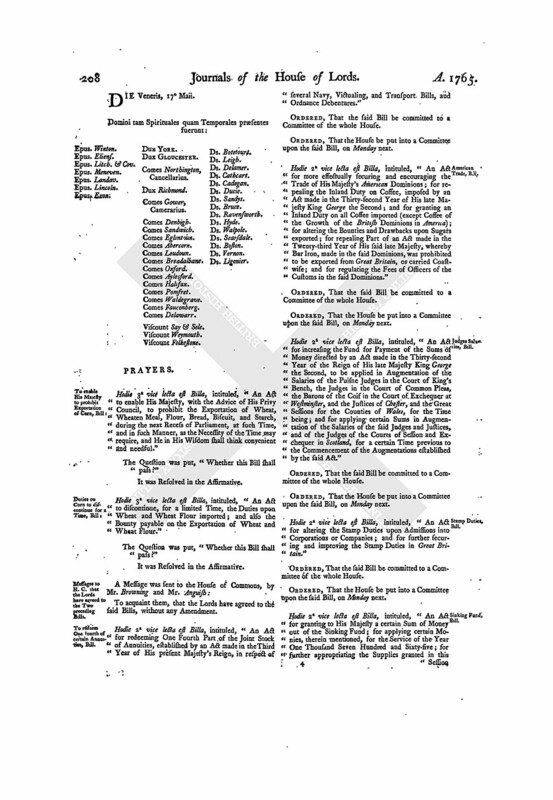 An Act to continue the Term, and render more effectual, an Act passed in the Thirtieth Year of the Reign of His late Majesty, for repairing and widening the Roads leading from Spalding High Bridge, through Littleworth, and by Frognall, and over James Deeping Stone Bridge in the County of Lincoln, to Maxey Outgang in the County of Northampton, adjoining to the High Road there. 13. An Act for repairing and widening the Road from the Great Bridge in the Borough of Warwick, through Southam and Daventry, to the Town of Northampton. 14. An Act for amending and widening the Road from the North End of Old Malton Gate, in the Town and Borough of New Malton, to the Town of Pickering, in the County of York. 15. An Act for the building a Bridge over the River Tay, at or near the Town of Perth, in the County of Perth. 16. An Act for dividing and enclosing several Lands and Grounds, Undivided Enclosures, Commons, and Wastes, in or near the Village or Hamlet of Marsborough, in the Township of Kimberworth, and in the Parish of Rotherham, in the County of York. 17. An Act for dividing and enclosing the Open and Common Fields and Common Pastures of Scalford, in the County of Leicester, and all the Lands and Grounds within the same Fields. 18. 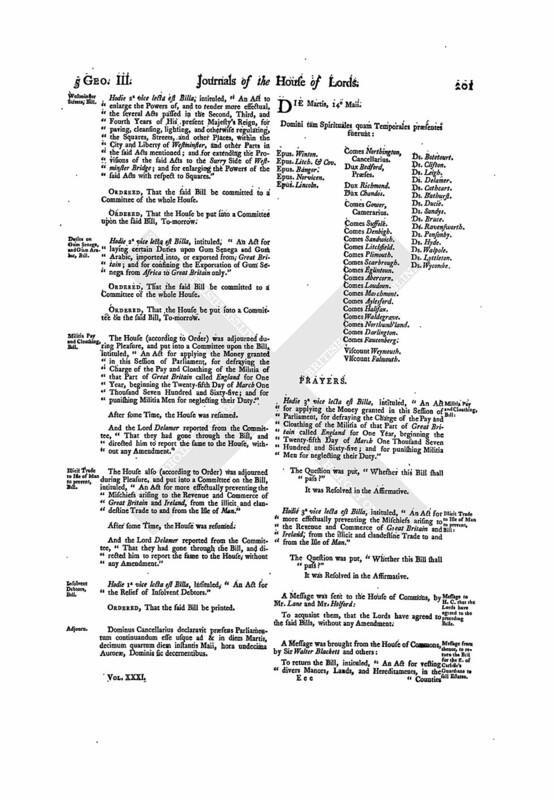 An Act for dividing and enclosing the Open and Common Fields, Common Meadows, Common Pastures, and other Commonable Lands and Grounds, in the Parish of Felmersham, in the County of Bedford. 19. An Act for vesting divers Manors, Lands, and Hereditaments, in the Counties of York, Cumberland, Northumberland, and Durham, late the Estate of Henry Earl of Carlisle, deceased, in Trustees, to be sold and disposed of, in and for the Payment of his Debts, Legacies, and Encumbrances, and other the Purposes in his Will mentioned. 20. 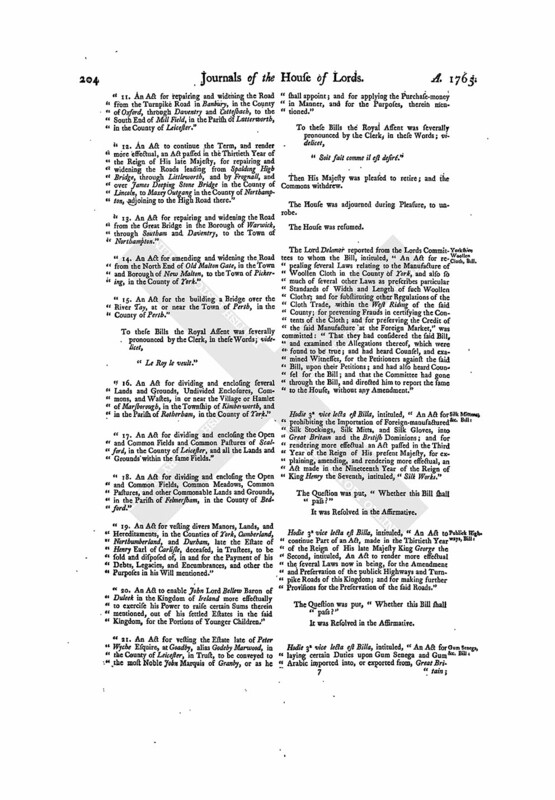 An Act to enable John Lord Bellew Baron of Duleek in the Kingdom of Ireland more effectually to exercise his Power to raise certain Sums therein mentioned, out of his settled Estates in the said Kingdom, for the Portions of Younger Children. 21. An Act for vesting the Estate late of Peter Wyche Esquire, at Goadby, alias Godeby Marwood, in the County of Leicester, in Trust, to be conveyed to the most Noble John Marquis of Granby, or as he shall appoint; and for applying the Purchase-money in Manner, and for the Purposes, therein mentioned. Soit fait comme il est desir. 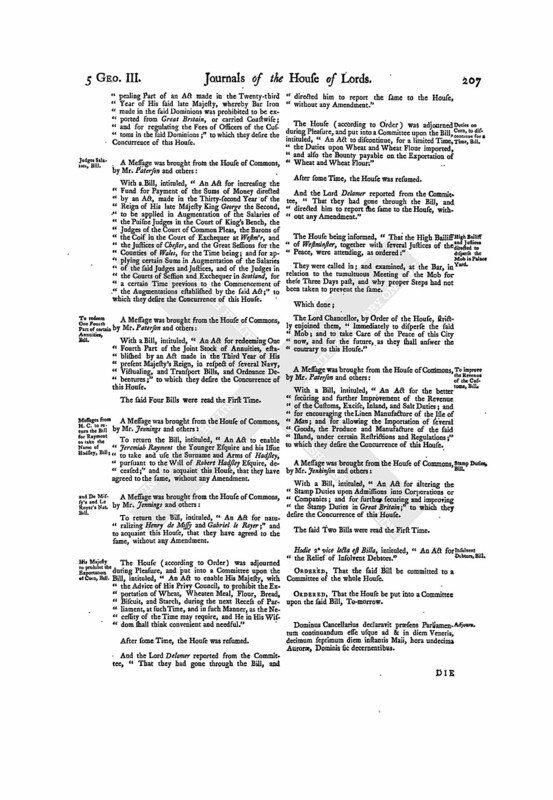 The Lord Delamer reported from the Lords Committees to whom the Bill, intituled, An Act for repealing several Laws relating to the Manufacture of Woollen Cloth in the County of York, and also so much of several other Laws as prescribes particular Standards of Width and Length of such Woollen Cloths; and for substituting other Regulations of the Cloth Trade, within the West Riding of the said County; for preventing Frauds in certifying the Contents of the Cloth; and for preserving the Credit of the said Manufacture at the Foreign Market, was committed: That they had considered the said Bill, and examined the Allegations thereof, which were found to be true; and had heard Counsel, and examined Witnesses, for the Petitioners against the said Bill, upon their Petitions; and had also heard Counsel for the Bill; and that the Committee had gone through the Bill, and directed him to report the same to the House, without any Amendment. Hodie 3a vice lecta est Billa, intituled, An Act for prohibiting the Importation of Foreign-manufactured Silk Stockings, Silk Mitts, and Silk Gloves, into Great Britain and the British Dominions; and for rendering more effectual an Act passed in the Third Year of the Reign of His present Majesty, for explaining, amending, and rendering more effectual, an Act made in the Nineteenth Year of the Reign of King Henry the Seventh, intituled, Silk Works. Hodie 3a vice lecta est Billa, intituled, An Act to continue Part of an Act, made in the Thirtieth Year of the Reign of His late Majesty King George the Second, intituled, An Act to render more effectual the several Laws now in being, for the Amendment and Preservation of the publick Highways and Turnpike Roads of this Kingdom; and for making further Provisions for the Preservation of the said Roads. Hodie 3a vice lecta est Billa, intituled, An Act for laying certain Duties upon Gum Senegal and Gum Arabic imported into, or exported from, Great Britain; and for confining the Exportation of Gum Senegal from Africa to Great Britain only. Hodie 3a vice lecta est Billa, intituled, An Act to enlarge the Powers of, and to render more effectual, the several Acts passed in the Second, Third, and Fourth Years of His present Majestys Reign, for paving, cleansing, lighting, and otherwise regulating, the Squares, Streets, and other Places, within the City and Liberty of Westminster, and other Parts in the. said Alts mentioned; and for. extending the Provisions of the said Acts to the Surry Side of Westminster Bridge; and for enlarging the Powers of the said Acts with respect. to Squares. Hodie 3a vice lecta est Billa, intituled, An Act for dividing and enclosing the Common Fields, Common Pastures, Common Meadows, Common Grounds, and Commonable Lands, within the Manor or Manors and Parish of Syresham, otherwise Siseham, in the County of Northampton. Hodie 3a vice lecta est Billa, intituled, An Act for dividing and enclosing certain Common Fields and Waste Ground in the Parish of Braithwell, in the County of York. Hodie 2a vice lecta est Billa, intituled, An Act to enable His Majesty, with the Advice of His Privy Council, to prohibit the Exportation of Wheat, Wheaten Meal, Flour, Bread, Biscuit, and Starch, during the next Recess of Parliament, at such Time, and in such Manner, as the Necessity of the Time may require, and He in His Wisdom shall think convenient and needful. Ordered, That the House be put into a Committee upon, the said Bill, To-morrow. With a Bill, intituled, An Act to prevent the Inconveniences arising from the present Method of it suing Notes and Bills by the Banks, Banking Companies, and Bankers, in that Part of Great Britain called Scotland; to which they desire the Concurrence of this House. With a Bill, intituled, An Act for repealing the Act made in the last Session of Parliament, intituled, An Act for vesting the Fort of Senegal and its Dependencies in the Company of Merchants trading to Africa; and to vest as well the said Fort and its Dependencies, as all other the British Forts and Settlements upon the Coast of Africa, lying between the Port of Sallee and Cape Rouge, together with all the Property, Estate, and Effects, of the Company of Merchants trading to Africa, in or upon the said Forts, Settlements, and their Dependencies, in His Majesty; and for securing, extending, and improving, the Trade to Africa; to which they desire the Concurrence of this House. With a Bill, intituled, An Act to explain, amend, and enforce, the several Laws now in being, relating to the raising and training the Militia within that Part of Great Britain called England; to which they desire the Concurrence of this House. The said Three Bills were read the First Time. Dominus Cancellarius declaravit prsens Parliamentum continuandum esse usque ad & in diem Jovis, decimum sextum diem instantis Maii, hora undecima Auror, Dominis sic decernentibus. Epus. Winton. Dux Gloucester. Ds. Botetourt. Epus. Asaphen. Comes Northington, Cancellarius. Ds. Leigh. Epus. Carliol. Comes Sandwich. Ds. Ducie. Comes Marchmont. Ds. Lovel & Holland. Hodie 2a vice lecta est Billa, intituled, An Act to explain, amend, and enforce, the several Laws now in being, relating to the raising and training the Militia within that Part of Great Britain called England. Ordered, That the House be put into a Committee, upon the said Bill, To-morrow. Hodie 2a vice lecta est Billa, intituled, An Act to prevent the Inconveniencies arising from the present Method of issuing Notes and Bills by the Banks, Banking Companies, and Bankers, in that Part of Great Britain called Scotland. Hodie 2a vice lecta est Billa, intituled, An Act for repealing the Act made in the last Session of Parliament, intituled, An Act for vesting the Fort of Senegal and its Dependencies in the Company of Merchants trading to Africa; and to vest as well the said Fort and its Dependencies, as all other the British Forts and Settlements upon the Coast of Africa, lying between the Port of Sallee and Cape Rouge, together with all the Property, Estate, and Effects, of the Company of Merchants trading to Africa, in or upon the said Forts, Settlements, and their Dependencies, in His Majesty; and for securing, extending, and improving, the Trade to Africa. Hodie 3a vice lecta est Billa, intituled, An Act for repealing several Laws relating to the Manufacture, of Woollen Cloth in the County of York; and also so much of several other Laws as prescribes particular Standards of Width and Length of such Woollen Cloths; and for substituting other Regulations of the Cloth Trade, within the West Riding of the said County; for preventing Frauds in certifying the Contents of the Cloth, and for preserving the Credit of the said Manufacture at the Foreign Market. It was Resolved in the Affirmatives. Ordered, by the Lords Spiritual and Temporal in Parliament assembled, That the High Bailiff of Westmr, the High Constable of Westmr, together with the other Constables, and some of the nearest Justices, do attend this House immediately. With a Bill, intituled, An Act for granting to His Majesty a certain Sum of Money out of the Sinking Fund; for applying certain Monies therein mentioned for the Service of the Year One Thousand Seven Hundred and Sixty-five; for further appropriating the Supplies granted in this Session of Parliament; for allowing to the Receivers General of the Duties on Offices and Employments in Scotland a Reward for their Trouble; and for allowing further Time to such Persons as have omitted to make and file Affidavits of the Execution of Indentures of Clerks to Attornies and Solicitors; to which they desire the Concurrence of this House. With a Bill, intituled, An Act for more effectually securing and encouraging the Trade of His Majestys American Dominions; for repealing the Inland Duty on Coffee, imposed by an Act made in the Thirty-second Year of His late Majesty King George the Second; and for granting an Inland Duty on all Coffee imported (except Coffee of the Growth of the British Dominions in America); for altering the Bounties and Drawbacks upon Sugars exported; for repealing Part of an Act made in the Twenty-third Year of His said late Majesty, whereby Bar Iron made in the said Dominions was prohibited to be exported from Great Britain, or carried Coastwise; and for regulating the Fees of Officers of the Customs in the said Dominions; to which they desire the Concurrence of this House. With a Bill, intituled, An Act for increasing the Fund for Payment of the Sums of Money directed by an Act, made in the Thirty-second Year of the Reign of His late Majesty King George the Second, to be applied in Augmentation of the Salaries of the Puisne Judges in the Court of Kings Bench, the Judges of the Court of Common Pleas, the Barons of the Coif in the Court of Exchequer at Westmr, and the Justices of Chester, and the Great Sessions for the Counties of Wales, for the Time being; and for applying certain Sums in Augmentation of the Salaries of the said Judges and Justices, and of the Judges in the Courts of Session and Exchequer in Scotland, for a certain Time previous to the Commencement of the Augmentations established by the said Act; to which they desire the Concurrence of this House. 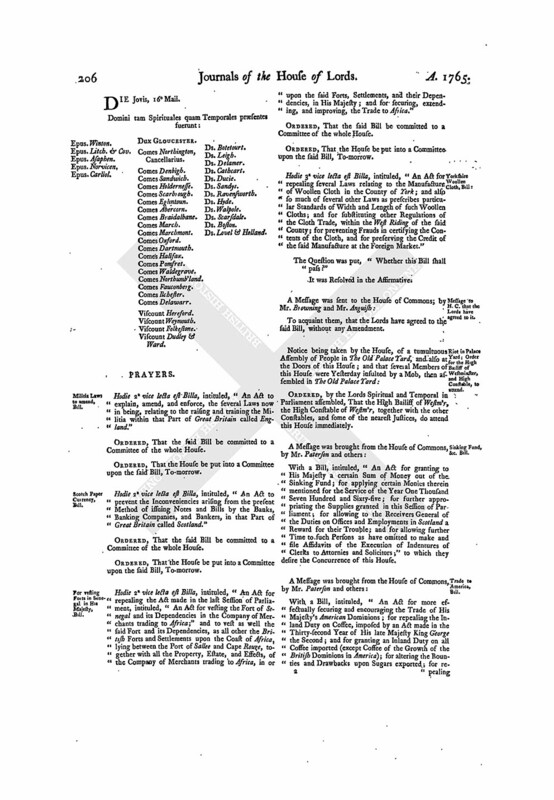 With a Bill, intituled, An Act for redeeming One Fourth Part of the Joint Stock of Annuities, established by an Act made in the Third Year of His present Majestys Reign, in respect of several Navy, Victualing, and Transport Bills, and Ordnance Debentures; to which they desire the Concurrence of this House. The said Four Bills were read the First Time. To return the Bill, intituled, An Act to enable Jeremiah Rayment the Younger Esquire and his Issue to take and use the Surname and Arms of Hadsley, pursuant to the Will of Robert Hadsley Esquire, deceased; and to acquaint this House, that they have agreed to the same, without any Amendment. To return the Bill, intituled, An Act for naturalizing Henry de Missy and Gabriel le Royer; and to acquaint this House, that they have agreed to the same, without any Amendment. The House (according to Order) was adjourned during Pleasure, and put into a Committee upon the Bill, intituled, An Act to enable His Majesty, with the Advice of His Privy Council, to prohibit the Exportation of Wheat, Wheaten Meal, Flour, Bread, Biscuit, and Starch, during the next Recess of Parliament, at such Time, and in such Manner, as the Necessity of the Time may require, and He in His Wisdom shall think convenient and needful. And the Lord Delamer reported from the Committee, That they had gone through the Bill, and directed him to report die same to the House, with out any Amendment. They were called in; and examined, at the Bar, in relation to the tumultuous Meeting of the Mob for these Three Days past, and why proper Steps had not been taken to prevent the same. The Lord Chancellor, by Order of the House, strictly enjoined them, Immediately to disperse the said Mob; and to take Care of the Peace of this City now, and for the future, as they shall answer the contrary to this House. 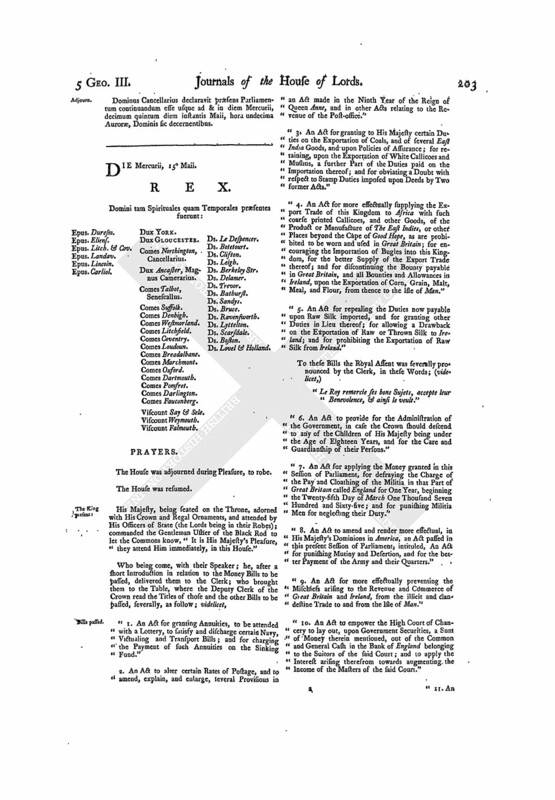 With a Bill, intituled, An Act for the better securing and further Improvement of the Revenue of the Customs, Excise, Inland, and Salt Duties; and for encouraging the Linen Manufacture of the Isle of Man; and for allowing the Importation of several Goods, the Produce and Manufacture of the said Island, under certain Restrictions and Regulations; to which they desire the Concurrence of this House. With a Bill, intituled, An Act for altering the Stamp Duties upon Admissions into Corporations or Companies; and for further securing and improving the Stamp Duties in Great Britain; to which they desire the Concurrence of this House. Hodie 2a vice lecta est Billa, intituled, An Act for the Relief of Insolvent Debtors. Dominus Cancellarius declaravit prsens Parliamentum continuandum esse usque ad & in diem Veneris, decimum septimum diem instantis Maii, hora undecima Auror, Dominis sic decernentibus. Epus. Winton. Dux York. Ds. Botetourt. Epus. Eliens. Dux Gloucester. Ds. Leigh. Epus. Litch. & Cov. Ds. Delamer. Epus. Meneven. Comes Northington, Cancellarius. Ds. Cathcart. Epus. Lincoln. Dux Richmond. Ds. Ducie. Hodie 3a vice lecta est Billa, intituled, An Act o enable His Majesty with the Advice of His Privy Council, to prohibit the Exportation of Wheat, Wheaten Meal, Flour, Bread, Biscuit, and Starch, during the next Recess of Parliament, at such Time, and in such Manner, as the Necessity of the Time may require, and He in His Wisdom shall think convenient and needful. Hodie 3a vice lecta est Billa, intituled, An Act to discontinue, for a limited Time, the Duties upon Wheat and Wheat Flour imported; and also the Bounty payable on the Exportation of Wheat and Wheat Flour. Hodie 2a vice lecta est Billa, intituled, An Act for redeeming One Fourth Part of the Joint Stock of Annuities, established by an Act made in the Third Year of His present Majestys Reign, in respect of several Navy, Victualing, and Transport Bills, and Ordnance Debentures. Ordered, That the House be put into a Committee upon the said Bill, on Monday next. Hodie 2a vice lecta est Billa, intituled, An Act for more effectually securing and encouraging the Trade of His Majestys American Dominions; for repealing the Inland Duty on Coffee, imposed by an Act made in the Thirty-second Year of His late Majesty King George the Second; and for granting an Inland Duty on all Coffee imported (except Coffee of the Growth of the British Dominions in America); for altering the Bounties and Drawbacks upon Sugars exported; for repealing Part of an Act made in the Twenty-third Year of His said late Majesty, whereby Bar Iron, made in the said Dominions, was prohibited to be exported from Great Britain, or carried Coastwise; and for regulating the Fees of Officers of the Customs in the said Dominions. Hodie 2a vice lecta est Billa, intituled, An Act for increasing the Fund for Payment of the Sums of Money directed by an Act made in the Thirty-second Year of the Reign of His late Majesty King George the Second, to be applied in Augmentation of the Salaries of the Puisne Judges in the Court of Kings Bench, the Judges in the Court of Common Pleas, the Barons of the Coif in the Court of. Exchequer at Westminster, and the Justices of Chester, and the Great Sessions for the Counties of Wales, for the Time being; and for applying certain Sums in Augmentation of the Salaries of the said Judges and Justices, and of the Judges of the Courts of Session and Exchequer in Scotland, for a certain Time previous to the Commencement of the Augmentations established by the said Act. Hodie 2a vice lecta est Billa, intituled, An Act for altering the Stamp Duties upon Admissions into Corporations or Companies; and for further securing and improving the Stamp Duties in Great Britain. Hodie 2a vice lecta est Billa, intituled, An Act for granting to His Majesty a certain Sum of Money out of the Sinking Fund; for applying certain Monies, therein mentioned, for the Service of the Year One Thousand Seven Hundred and Sixty-five; for further appropriating the Supplies granted in this Session of Parliament; for allowing to the Receivers General of the Duties on Offices and Employments in Scotland a Reward for their Trouble; and for allowing further Time to such Persons as have omitted to make and file Affidavits of the Execution of Indentures of Clerks to Attornies and Solicitors. Hodie 2a vice lecta est Billa, intituled, An Act for the better securing and further Improvement of the Revenues of Customs, Excise, Inland, and Salt, Duties; and for encouraging the Linen Manufacture of the Isle of Man; and for allowing the Importation of several Goods, the Produce and Manufacture of the said Island under certain Restrictions and Regulations. The House (according to Order) was adjourned during Pleasure, and put into a Committee upon the Bill, intituled, An Act to explain, amend, and enforce, the several Laws now in being, relating to the raising and training the Militia within that Part of Great Britain called England. The House (according to Order) was adjourned during Pleasure, and put into a Committee upon the Bill, intituled, An Act for repealing the Act made in the last Session of Parliament, intituled, An Act for vesting the Fort of Senegal and its Dependencies in the Company of Merchants trading to Africa; and to vest as well the said Fort and its Dependencies, as all other the British Forts and Settlements upon the Coast of Africa, lying between the Port of Sallee and Cape Rouge, together with all the Property, Estate, and Effects, of the Company of Merchants trading to Africa, in or upon the said Forts, Settlements, and their Dependencies, in His Majesty; and for securing, extending, and improving, the Trade to Africa. The House (according to Order) was adjourned during Pleasure, and put into a Committee upon the Bill, intituled, An Act to prevent the Inconveniencies arising from the present Method of issuing Notes and Bills by the Banks, Banking Companies, and Bankers, in that Part of Great Britain called Scotland. The House (according to Order), was adjourned during Pleasure, and put into a Committee upon the Bill, intituled, An Act for the Relief of Insolvent Debtors. Resolved, Nemine Dissentiente, by the Lords Spiritual and Temporal in Parliament assembled, That the of faulting, insulting, or menacing, any Member of this House in his coming to or going from this House, or upon account of his Behaviour in Parliament, is an high Infringement of the Privilege of this House, a most outrageous and dangerous Violation of the Rights of Parliament, and an high Crime and Misdemeanour. Resolved, Nemine Dissentiente, by the Lords Spiritual and Temporal in Parliament assembled, That the assembling and coming of any Number of Persons, in a riotous, tumultuous, and disorderly Manner, to this House, in order either to hinder or promote the passing of any Bill, or other Matter depending before the House, is an high Infringement of the Privilege of this House, is destructive of the Freedom and Constitution of Parliament, and an high Crime and Misdemeanour. Resolved, Nemine Dissentiente, by the Lords Spiritual and Temporal in Parliament assembled, That the inciting or encouraging any Number of Persons to come, in a riotous, tumultuous, and disorderly Manner, to this House, in order either to hinder or promote the passing of any Bill, or other Matter depending before the House, is an high Infringement of the Privilege of this House, is destructive of the Freedom and Constitution of Parliament, and an high Crime and Misdemeanour. 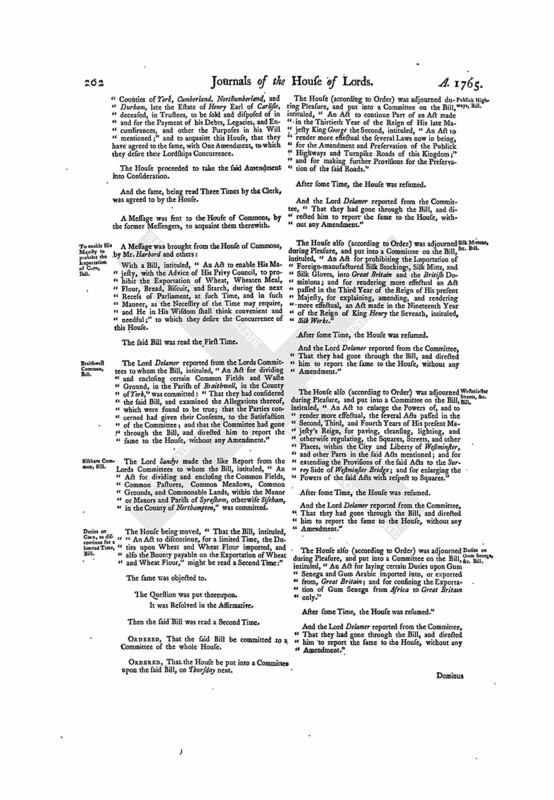 Ordered, by the Lords Spiritual and Temporal in Parliament assembled, That these Resolutions be printed; and that some of the printed Copies thereof be sent to the Lord Mayor of London, the Sheriffs of London and Middlesex, and the High Bailiff of Westminster. Ordered, That all the Lords who have been present this Session be appointed a Committee, to consider bf the great Tumult at the Doors of this House this and the Two preceding Days. Their. Lordships, or any Five of them; to meet immediately, in the Princes Lodgings near the House of Peers; and to adjourn as they please. Dominus Cancellarius declaravit prsens Parliamentum continuandum esse usque ad & in diem Lun, vicesimum diem instantis Maii, hora undecima Auror, Dominis sic decernentibus. Epus. Asaphen. Dux Gloucester. Ds. Delamer. Epus. Norvicen. Comes Northington, Cancellarius. Ds. Bathurst. Epus. Carliol. Dux Richmond. Ds. Dude. Epus. Exon. Dux Portland. Ds. Edgecumbe. Comes Gower, Camerarius. Ds. Ravensworth. Comes Litchfield. Ds. Lovel & Holland. Hodie 3a vice lecta est Billa, intituled, An Act to explain, amend, and enforce, the several Laws now in being, relating to the raising and training the Militia within that Part of Great Britain called England. Hodie 3a vice lecta est Billa, intituled, An Act to prevent the Inconveniencies arising from the present Method of issuing Notes and Bills by the Banks, Banking Companies, and Bankers, in that Part of Great Britain called Scotland. Ordered, That an humble Address be presented to His Majesty, To represent to His Majesty, that a tumultuous and riotous Mob of several Thousand idle and disorderly Persons, arrayed under Banners, and directed by Leaders, assembled at the House of Lords, on the 15th, 16th, and 17th Days of this Instant, to the Terror and Danger of the Lords Spiritual and Temporal in Parliament assembled, in Breach of the Privilege, and in Violation of the Freedom, of Parliament; and that the Persons so assembled, or a great Number of them, riotously, and in open Violation of the Laws, assaulted and endangered the Life pf his Grace the Duke of Bedford, in his Return from the House of Lords, beset his Graces House in Bloomsbury Square, and would probably have committed the moll enormous Outrages there, had they not been prevented by a Military Force assisting the Civil Magistrates, as Pap of the Posse Comitats: And most humbly, to beseech His Majesty, that He will be graciously pleased to issue a Proclamation forthwith, to command all Civil Magistrates, within the City of London, the County of Middlesex, and the City and Liberties of Westminster to enforce the Execution of the wholesome Laws of this. Kingdom, against Riots, Routs, and unlawful Assemblies. Ordered That the said H. S. Woodfall do attend this House, To-morrow. The Lord Chamberlain reported, That the Lords with White Staves had (according to Order) presented to His Majesty the Address of this House, humbly recommending Mr. Wight to His Majestys Royal Grace and Bounty, for his great Pains and Diligence, for Forty Years and upwards, during his executing the several Offices of Reading Clerk and Clerk Assistant in this House; and that His Majesty was pleased to say, He would give Directions accordingly. The Lord Chancellor acquainted the House, That he was desired by Mr. Cowper, the Clerk of the Parliaments, to inform their Lordships, That, upon the Resignation of Mr. Joseph Wight, the Clerk Assistant, he had appointed Mr. Samuel Strult to be Clerk Assistant, under certain Conditions in a Paper mentioned, which the said Mr. Cowper and Mr. Strutt had signed; and which, the Clerk of the Parliaments hoped, would have their Lordships Approbation. That Mr. Cowper, the Clerk of the Parliaments, have Leave of this House to appoint Mr. Strutt, Clerk Assistant, with the whole Profits thereof, till either of Mr. William Cowpers Sons shall attain the Age of Twenty-one Years, and shall be approved by the House of Lords as a Person sufficient for the Execution of the said Office; and, in case either of Mr. Cowpers Sons shall be admitted into such Office, such Son is to allow Three Hundred Pounds per Annum to Mr. Strutt during such Sons continuing in the said Office, such Annuity determinable, nevertheless, with the Life of Mr. Strutt, or upon Mr. Cowpers appointing him to the Office of Reading Clerk with the like Approbation. Ashley Cowper, Cler. Parliament or. Samuel Strutt. The same was agreed to by the House; and ordered accordingly. Dominus Cancellarius declaravit prsens Parliamentum continuandum esse usque ad & in diem Martis, vicesimum primum diem instantis Maii, hora undecima Auror, Dominis sic decernentibus.